It is easy to see that there is a diminishing return, in terms of fuel cost, as MPG gets higher. For example, increasing MPG from 10 to 20 saves $2000 per 10,000 miles traveled. However, increase MPG from 30 to 40 saves just $333.33 per 10,000 miles traveled. We can see from the graph that GPM and fuel cost are linearly related, so GPM is clearly a superior measure if our concern is operating cost. It is also a superior measure for those concerned about environmental impacts since GPM is also proportional to the gallons of fuel burned. 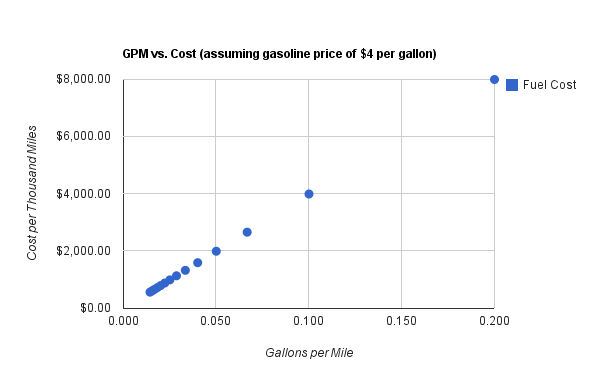 The tables below show the fuel efficiency for some common cars in both MPG and GPM. These tables also shows the fuel cost per 10,000 miles at $4 per gallon. This cost varies proportionally with GPM. How Much is Fuel Efficiency Worth? So, back to my original comment about the recent run-up in prices for the used Toyota Prius. Is a 30% increase in prices justified by rising fuel prices? For comparison, lets use the fuel economy for city driving, where the Prius shines most, and compare that to the most fuel efficient car from the 10 best selling cars of 2010. The Toyota Corolla and the Honda Civic both have an estimated fuel cost of $1,538.46 per 10,000 miles of city driving. The Prius has a fuel cost of $784.31 per 10,000 miles. A savings of $754.14 is certainly meaningful, but this is total savings per 10,000 miles. Since the beginning of the year, the price of gasoline has increased by a little less than $1 per gallon, so the increase in savings is only about $189 per 10,000 miles. This doesn’t seem to be sufficient savings to justify a price increase on used Priuses of $5000 to $6000 over a 4 month period….unless the buyer expects very large near-term gasoline price increases or plans to drive the car for several hundred thousand miles! I think that the increase in Prius prices must be the result of more than just the increase in fuel prices or even expectations of future fuel price increases. Instead, I think there are some consumers who simply want to burn as little gasoline as possible, even if they have to pay a premium to achieve this goal. There is nothing wrong with this viewpoint, but it seems the shortage of available Prius vehicles as a result of the Japan quake has caused the “eco-premium” to rise substantially. I am a fan a fuel efficiency and low vehicle operating cost, but I think the relationship between fuel efficiency and driving cost is poorly understood as a result of our focus on MPG. There is a big bang for your buck when moving away from a gas-guzzling vehicle with low MPG, but there is a diminishing return as MPG increases. If we condition ourselves to evaluate fuel economy using GPM instead of MPG we will be better equipped to properly evaluate the trade-offs between fuel economy and other vehicle selection criteria. Note: The Google Docs spreadsheet used to generate the plots and tables in this post is available here. Public editing of the sheet is not enabled, so you will need to save a copy if you wish to make your own modifications. 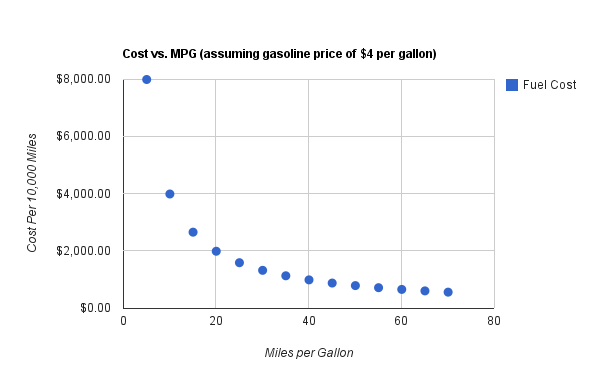 a bit over 40 years ago i saw the mpg vs cost plot and very soon realized that if you got close to 20 mpg you were doing well on cost per total yearly cost. During that era of my life, I was very careful to record all expenses of my transportation … when i changed cars, i found that the 100,000 miles I had driven it had cost me just a trifle less than 1 cent per mile! that included initial purchase, insurance and repairs etc.. Does anyone consider that without time there is no speed? Time is the quantity factor in this equation for me, and less time driving is better.